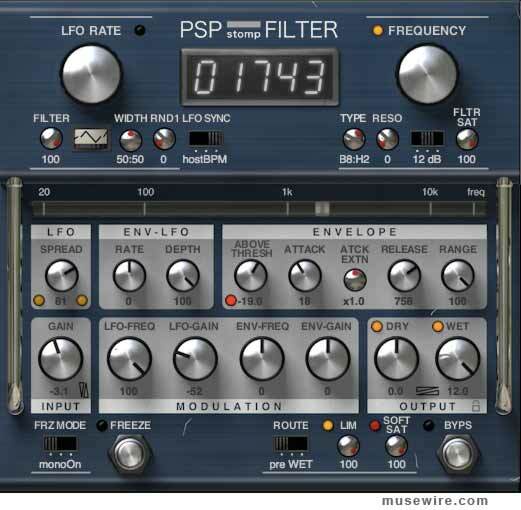 The folks at PSP have announced a new “stompbox” filter plugin, appropriately called PSP stompFilter. They describe it as “a creative tool designed to provide an exceptionally wide range of modulated filter and gain sounds.” Its effects include a simple LFO modulated low pass filter; auto-wah; low-, band-, or high-pass filter; and compressor. Thanks to the smoothly adjustable filter type and flexible cross-modulations of the LFO by the envelope of the signal, PSP stompFilter is able to provide vivid, expressive filtering. Just a pinch of adjustable LFO randomization will provide analog-like “imperfections,” ensuring that you will never get bored of it. Available now for Mac and Windows in all popular plug-in formats. Intro offer: Until the 30th of November 2016 you can buy PSP stompFilter at the special introductory price of $49*. Starting from the 1st December 2016 the regular price of $69* will be applied (*all prices exclude taxes). The fully featured 14 days demo version is available on their download page: https://pspaudioware.net/register/demo.php.